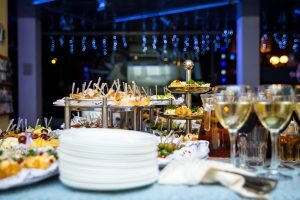 You may be lucky if the venue you’re thinking of also provides a catering service, but chances are that you’ll be adding it on your priority list anyway. 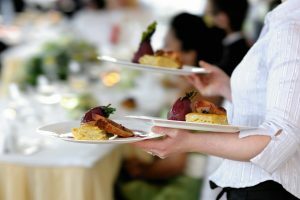 Planning and choosing your wedding catering is exhaustive and will likely take up the biggest portion of your budget, after all, so it’s important that you know how to feed your guests. 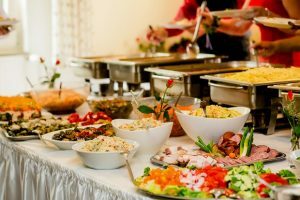 If you’re having a hard time figuring this out, then read on to find out more about finding the perfect wedding catering service for you. 1. Do your research beforehand. Go to different catering services so you can compare and contrast what each one has to offer and where you think you’ll get the best deal. Just be sure to tell them your expected headcount so that all your guests will be accommodated without having to wait too long. Another thing that you want to keep in mind when comparing catering services is whether they provide alcohol. If that option is available, make sure that the catering company is licensed to do so. Lastly, read their reviews and ask around about the quality of that particular caterer’s service. Even the little things such as the wait staff’s quality of service can make or break a wedding. Know exactly how much you’re willing to spend before you begin to approach the caterer of your choice. It allows the company that you want to approach to be able to work around it in order to cater to your needs within the set budget. Think about what is and isn’t included in the catering package, such as linens and tableware, as this could vary from one caterer to another. 3. Ask the venue’s management for suggestions or requirements. If the venue for your reception also provides catering, then you don’t need to worry too much at all. They may even work with different catering services and have a list that you can choose from, but that doesn’t mean that you can only choose from their roster. If you insist on bringing your preferred catering service to the venue, be sure to ask if the venue’s management has any special requirements. Though most catering services won’t allow you to sample their dishes until after you’ve signed or given a down payment for their services, you can go for a sample if they host dinners or serve at bridal expos. You can also look up their schedule of events to see which ones you can attend.